Alana is the first smiling face you will see when you enter our hospital. She make appointments, checks in patients, and can always remember a face! She has worked here since 1996. 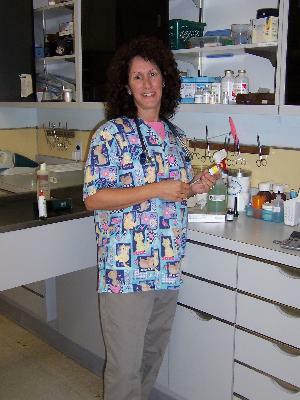 Lynda, has been with the Nanuet Animal Hospital since 1991. After working part-time for a few years when her children were still young, Lynda decided to go back to school to earn her degree in veterinary technology. After graduating from Cedar Valley College with honors, Lynda passed the national licensing exam! In 2013, Lynda became a member of the Academy of Veterinary Technicians in Clinical Practice! Lynda is an active member of several professional veterinary groups and partakes in continuing education opportunities. She also is a moderator at the Veterinary Support Personnel network. Aerin joined the team in 2010. She became a licensed technician in 2014. She lives with her husband and retired racing greyhound, Silvie! Working in the veterinary field is a dream come true! She is thankful everyday to be able to help people and their pets. Plus, being able to play with puppies is not too bad either! Andrea joined us as as assistant in high school. Now studying at Rockland Community College, she has taken on more responsibilities here at the hospital.